I truly feel How to Win Friends and Influence People by best-selling author Dale Carnegie helped a shy introvert understand human nature and gave him the tools he needed to step from the shadows and begin enjoying the stories and company of others on his own terms. Yes, that introvert was me, and now I want to give back a little by giving you a free copy of this motivational and personal development classic in e-book format. 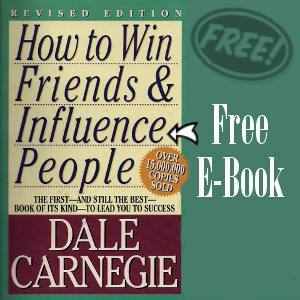 One of the first books I read as a young adult, interested in business, was How to Win Friends and Influence People. In the mid-eighties, (yeah, I’m old) I found myself attending seminar after seminar. One of those seminars was from a long-gone marketing program called A.L. Williams. The impressive speaker not only recommended everyone read “How to Win Friends and Influence People”, he even handed out free paperbacks. I don’t recall his name but I do remember that he suggested we read this book once a year for no less than five years – which I did. How to Win Friends and Influence People is a phenomenal book written way back in 1936. This free eBook is the 1981 Revised Edition and it’s as powerful and relevant as it was thirty years ago when I first read it. There are hundreds of reviews online so I’m not going to bore you with writing yet another one here but I will recommend you read the book at least once. No time to read? Then listen to it on YouTube.